Vasculitis in small vessels, including arterioles, capillaries, and venules, a characteristic of MPA, is absent in polyarteritis nodosa. This absence is the proposed distinguishing feature between those two disorders. Granulomatosis with polyangiitis (Wegener granulomatosis, GPA), MPA, and eosinophilic granulomatosis with polyangiitis (Churg-Strauss syndrome, EGPA) comprise a category of small vessel vasculitis related to antineutrophil cytoplasmic antibodies (ANCAs) and are characterized by a paucity of immune deposits. MPA and GPA seem to be part of a clinical spectrum. However, an absence of granuloma formation and sparing of the upper respiratory tract are features of MPA. These features help to distinguish MPA from GPA, although the two conditions are occasionally difficult to distinguish. 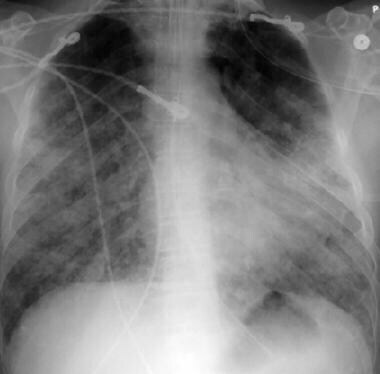 The image below depicts pulmonary alveolar capillaritis. Immunosuppressive medications are used to control MPA. The choice of agents depends in part on the extent of disease, the rate of progression, and the degree of inflammation. See Treatment and Medication. Vasculitis is inflammation of the vessel walls. This may lead to necrosis and bleeding. MPA is characterized by pauci-immune, necrotizing, small vessel vasculitis without clinical or pathological evidence of granulomatous inflammation. Based on current understanding of the inflammatory response, cytokine-mediated changes in the expression and function of adhesion molecules coupled with inappropriate activation of leukocytes and endothelial cells are postulated to be the primary factors influencing the degree and location of vessel damage in the vasculitis syndromes. However, the stimuli that initiate these pathologic inflammatory changes are not well understood. ANCA may play a role in the pathogenesis of MPA. In the United States, the annual incidence of MPA is 3.6 cases per million persons. The prevalence is one to three cases per 100,000 population. Internationally, the incidence is approximately two cases per 100,000 persons in the United Kingdom and approximately one case per 100,000 persons in Sweden. With treatment, 90% of patients with MPA improve and 75% achieve complete remission. The 5-year survival rate is approximately 75%. MPA carries a worse long-term survival rate than granulomatosis with polyangiitis or Churg-Strauss syndrome, probably because of renal involvement at disease onset. Guillevin L, Durand-Gasselin B, Cevallos R, et al. Microscopic polyangiitis: clinical and laboratory findings in eighty-five patients. Arthritis Rheum. 1999 Mar. 42(3):421-30. [Medline]. Fries JF, Hunder GG, Bloch DA, et al. The American College of Rheumatology 1990 criteria for the classification of vasculitis. Summary. Arthritis Rheum. 1990 Aug. 33(8):1135-6. [Medline]. Lightfoot RW, Michel BA, Bloch DA, et al. The American College of Rheumatology 1990 criteria for the classification of polyarteritis nodosa. Arthritis Rheum. 1990 Aug. 33(8):1088-93. [Medline]. Jennette JC. Overview of the 2012 revised International Chapel Hill Consensus Conference nomenclature of vasculitides. Clin Exp Nephrol. 2013 Oct. 17 (5):603-606. [Medline]. [Full Text]. Amezcua-Guerra LM, Prieto P, Bojalil R, Pineda C, Amigo MC. Microscopic polyangiitis associated with primary biliary cirrhosis: a causal or casual association?. J Rheumatol. 2006 Nov. 33(11):2351-3. [Medline]. Seligman VA, Bolton PB, Sanchez HC, Fye KH. Propylthiouracil-induced microscopic polyangiitis. J Clin Rheumatol. 2001 Jun. 7(3):170-4. [Medline]. Oh YJ, Ahn SS, Park ES, Jung SM, Song JJ, Park YB, et al. Chest and renal involvements, Birmingham vascular activity score more than 13.5 and five factor score (1996) more than 1 at diagnosis are significant predictors of relapse of microscopic polyangiitis. Clin Exp Rheumatol. 2017 Jan 19. [Medline]. Robson J, Doll H, Suppiah R, Flossmann O, Harper L, Höglund P, et al. Glucocorticoid treatment and damage in the anti-neutrophil cytoplasm antibody-associated vasculitides: long-term data from the European Vasculitis Study Group trials. Rheumatology (Oxford). 2014 Sep 8. [Medline]. Hassan TM, Hassan AS, Igoe A, Logan M, Gunaratnam C, McElvaney NG, et al. Lung involvement at presentation predicts disease activity and permanent organ damage at 6, 12 and 24 months follow - up in ANCA - associated vasculitis. BMC Immunol. 2014 May 27. 15:20. [Medline]. [Full Text]. Crickx E, Machelart I, Lazaro E, et al. Intravenous Immunoglobulin as an Immunomodulating Agent in Antineutrophil Cytoplasmic Antibody-Associated Vasculitides: A French Nationwide Study of Ninety-Two Patients. Arthritis Rheumatol. 2016 Mar. 68 (3):702-12. [Medline]. Stone JH, Merkel PA, Spiera R, et al. Rituximab versus cyclophosphamide for ANCA-associated vasculitis. N Engl J Med. 2010 Jul 15. 363(3):221-32. [Medline]. [Full Text]. Jayne D, Rasmussen N, Andrassy K, et al. A randomized trial of maintenance therapy for vasculitis associated with antineutrophil cytoplasmic autoantibodies. N Engl J Med. 2003 Jul 3. 349(1):36-44. [Medline]. Pagnoux C, Mahr A, Hamidou MA, Boffa JJ, Ruivard M, Ducroix JP, et al. Azathioprine or methotrexate maintenance for ANCA-associated vasculitis. N Engl J Med. 2008 Dec 25. 359 (26):2790-803. [Medline]. [Full Text]. Puéchal X, Pagnoux C, Perrodeau É, et al. Long-Term Outcomes Among Participants in the WEGENT Trial of Remission-Maintenance Therapy for Granulomatosis With Polyangiitis (Wegener's) or Microscopic Polyangiitis. Arthritis Rheumatol. 2016 Mar. 68 (3):690-701. [Medline]. Terrier B et al; French Vasculitis Study Group. Long-term efficacy of remission-maintenance regimens for ANCA-associated vasculitides. Ann Rheum Dis. 2018 May 3. [Medline]. Charles P et al; French Vasculitis Study Group. Comparison of individually tailored versus fixed-schedule rituximab regimen to maintain ANCA-associated vasculitis remission: results of a multicentre, randomised controlled, phase III trial (MAINRITSAN2). Ann Rheum Dis. 2018 Apr 25. [Medline]. Reinhold-Keller E, De Groot K, Rudert H, Nölle B, Heller M, Gross WL. Response to trimethoprim/sulfamethoxazole in Wegener's granulomatosis depends on the phase of disease. QJM. 1996 Jan. 89(1):15-23. [Medline]. Langford CA, Talar-Williams C, Sneller MC. Mycophenolate mofetil for remission maintenance in the treatment of Wegener's granulomatosis. Arthritis Rheum. 2004 Apr 15. 51(2):278-83. [Medline]. Iatrou C, Zerbala S, Revela I, Spanou E, Marinaki S, Nakopoulou L, et al. Mycophenolate mofetil as maintenance therapy in patients with vasculitis and renal involvement. Clin Nephrol. 2009 Jul. 72(1):31-7. [Medline]. Haubitz M, Koch KM, Brunkhorst R. Cyclosporin for the prevention of disease reactivation in relapsing ANCA-associated vasculitis. Nephrol Dial Transplant. 1998 Aug. 13 (8):2074-6. [Medline]. Terrier B, Saadoun D, Sène D, Ghillani P, Amoura Z, Deray G, et al. Antimyeloperoxidase antibodies are a useful marker of disease activity in antineutrophil cytoplasmic antibody-associated vasculitides. Ann Rheum Dis. 2009 Oct. 68(10):1564-71. [Medline]. Watanabe H et al, for Japan Research Committee of the Ministry of Health Labour,Welfare for Intractable Vasculitis (JPVAS) Research Committee of Intractable Renal Disease of the Ministry of Health Labour, Welfare of Japan. Association between reappearance of myeloperoxidase-antineutrophil cytoplasmic antibody and relapse in antineutrophil cytoplasmic antibody-associated vasculitis: Subgroup analysis of nationwide prospective cohort studies. Arthritis Rheumatol. 2018 May 22. [Medline]. Suppiah R, Judge A, Batra R, Flossmann O, Harper L, Höglund P, et al. A model to predict cardiovascular events in patients with newly diagnosed wegener's granulomatosis and microscopic polyangiitis. Arthritis Care Res (Hoboken). 2011 Jan 14. [Medline]. Guillevin L, Pagnoux C, Karras A, Khouatra C, Aumaître O, Cohen P, et al. Rituximab versus azathioprine for maintenance in ANCA-associated vasculitis. N Engl J Med. 2014 Nov 6. 371(19):1771-80. [Medline]. Falk RJ, Hogan S, Carey TS, Jennette JC. Clinical course of anti-neutrophil cytoplasmic autoantibody-associated glomerulonephritis and systemic vasculitis. The Glomerular Disease Collaborative Network. Ann Intern Med. 1990 Nov 1. 113(9):656-63. [Medline]. Haubitz M, Koch KM, Brunkhorst R. Cyclosporin for the prevention of disease reactivation in relapsing ANCA-associated vasculitis. Nephrol Dial Transplant. 1998 Aug. 13(8):2074-6. [Medline]. Jayne D. Review article: Progress of treatment in ANCA-associated vasculitis. Nephrology (Carlton). 2009 Feb. 14(1):42-8. [Medline]. Lane SE, Watts RA, Shepstone L, Scott DG. Primary systemic vasculitis: clinical features and mortality. QJM. 2005 Feb. 98(2):97-111. [Medline]. Histopathology of alveolar hemorrhage in alveolar capillaritis.